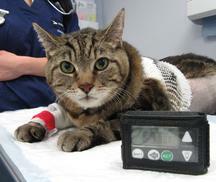 The society promotes strictly animal-friendly clinical research in comparative endocrinology. Please find below how colleagues can help in the various clinical trials currently ongoing around Europe and beyond. Perhaps you are currently treating a diabetic cat that could benefit from participating in a cutting edge trial somewhere in Europe? Do you have a clinical trial you want to advertise here? Please contact an ESVE board member to discuss the possibilities.